In a secluded farmhouse a family is tormented by some dark entity; they seek help from Ed and Lorraine, renowned paranormal investigators who agree, but then find themselves placed against the most powerful demon they have ever faced. 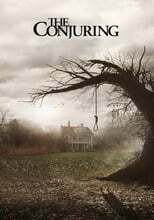 The Conjuring is directed by James Wan and was released on Jul 19th, 2013. Director James Wan's Horror & Thriller movie The Conjuring is produced by Evergreen Media Group & New Line Cinema & was released 2013-07-18.